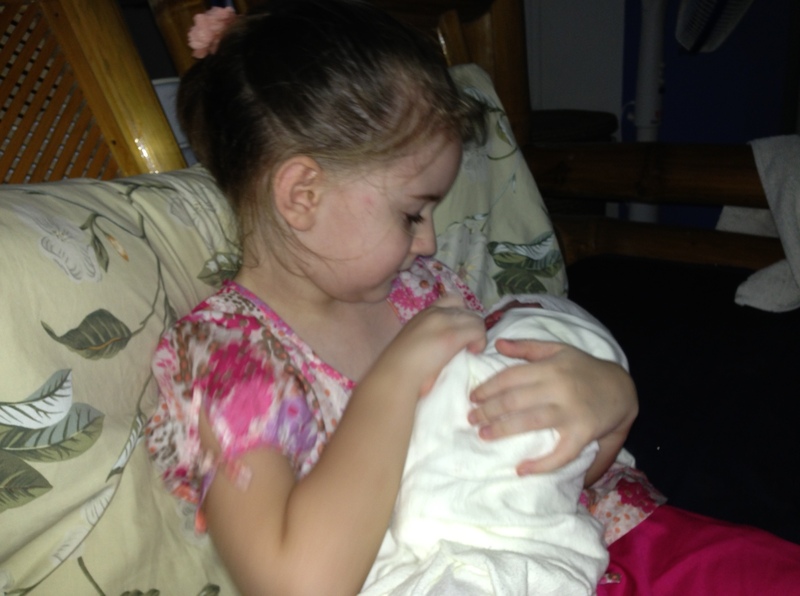 I was on day shift last week when a heavily pregnant woman walked into the birth room. This is an everyday occurrence at the clinic, of course, but I was particularly interested in this mother because her brightly colored clothing identified her as a Badjao and I had yet to care for any patients from among the “Sea Gypsies.” As I stood up and spoke a welcome the older woman who was with her grasped my hand and shook it vehemently, a huge smile on her face. The Badjao tribal people are poor, uneducated, outcasts in Philippine society. Their ancestors were nomadic seafarers whose religion was a combination of animism and Islam. 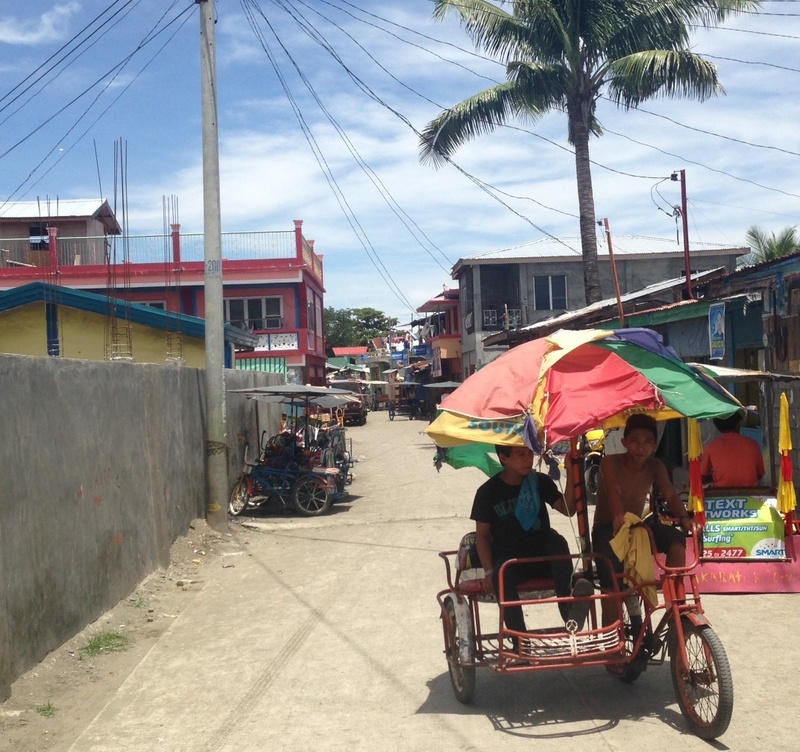 Many are now settled in the slums in Davao city and some have become Christians. The clinic where I am volunteering sends a team of midwives twice a month to do “outreach” prenatal care in Isla Verde, an area where many Badjao live. The young pregnant woman and her mother-in-law were from a different community and so she had not had any prenatal care yet. She was not in labor but knew she was near the end of her pregnancy, and she wanted to give birth at Mercy. 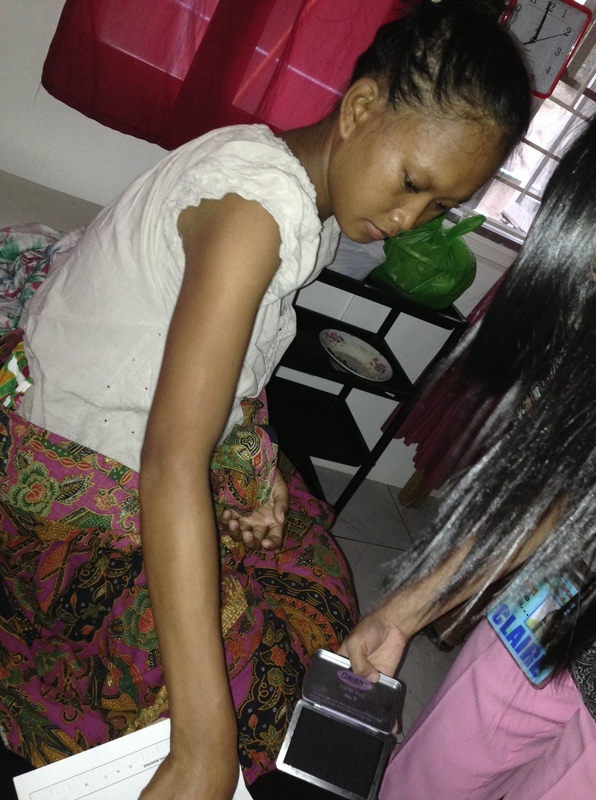 After I finished the prenatal check-up, I offered to pray for her and her baby. As I began to pray in English the mother-in-law immediately and without hesitation began to pray with me. Neither of us knew the other’s language but that was no barrier to joining together in prayer for the mother and baby! Such a beautiful “this is why I’m here” moment. A week later, I arrived for day shift just before 6 am. The Badjao woman I had met the previous week had come in two hours before and quickly pushed out her healthy baby boy! I had time to do little more than greet the family with a smile of recognition before another Badjao patient arrived in labor. She walked in at 6:15 am and pushed out her baby boy at 6:20. While the birth went quickly and smoothly this mother experienced an immediate postpartum hemorrhage. In the two minutes after the birth that it took for us to administer medications, deliver the placenta, and get her bleeding under control she had already lost a significant amount of blood, enough to cause her blood pressure to drop drastically and her pulse to race. 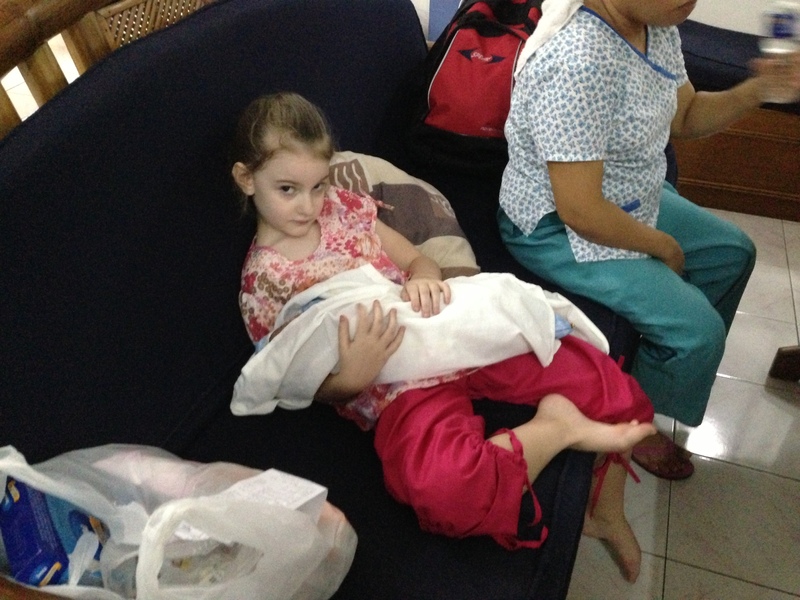 The immediate care she received may well have been lifesaving. Thumbprint in lieu of a signature on baby Janimal’s birth certificate. This morning little Janimal and his mother returned to the clinic for a postpartum checkup and BCG vaccination (tuberculosis vaccine for babies which we offer every two weeks.) I was headed out for the first time with the team going on outreach to Isla Verde. We were able to give them a ride home since we were headed their way! 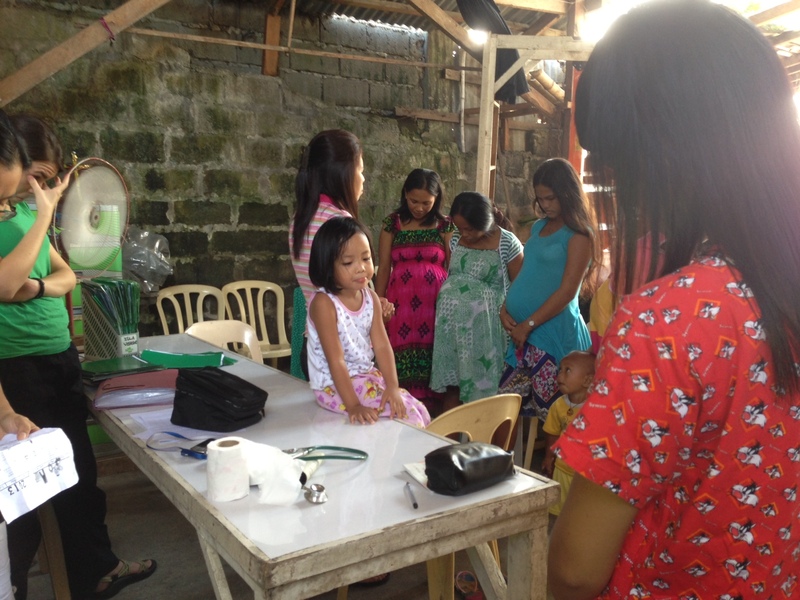 The Isla Verde outreach takes place every two weeks at a free clinic run by an amazing Filipina woman. Not all of the families in the neighboring area are Badjao, but there is a large Badjao community nearby. Most of the Badjao patients and many Muslim patients who come to the birth center in labor are from the Isla Verde outreach. There were six or eight pregnant patients waiting in the makeshift clinic when we arrived but more trickled in, so that in the end we did prenatal checkups for about 15 including four who were being seen for the first time. Many did not know when they were due or their own birthdate, most could not read. I did a prenatal checkup on a sweet young mom, pregnant with her second. Her highest education completed (per her history form) is second grade, and she now makes her living selling sunglasses on a street corner. She is the same age as my oldest daughter. 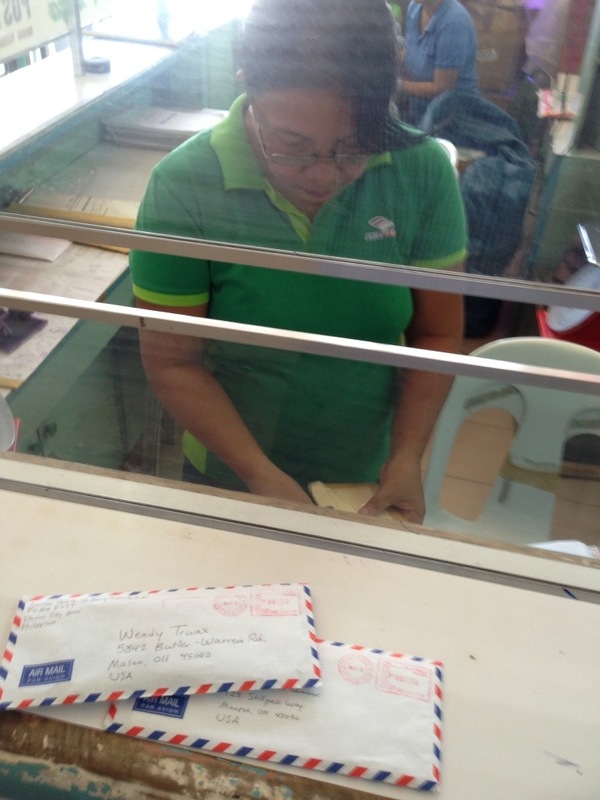 Please continue to pray for our work here in Davao. We have been blessed with some dear Pinoy friends in our first five months, and preeminent among them are Roy and Kathie P and their children, who are a little extra sympathetic to us ‘kanos because, though from Davao, they lived in California until recently. They have helped us with many recommendations and directions, with recipes and rebinding of books, with cultural know-how and encouragement. And food. Lots of good food. (Ate Kathie makes a leche flan that is the yummiest new dish I have tasted here.) In an effort to make sure that we have a proper cultural experience, Kathie and Roy have also “taken us in hand”, as the badger from The Wind in the Willows would say. 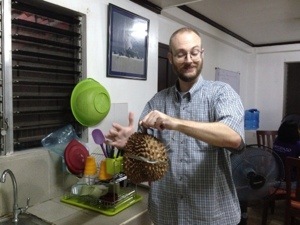 Last night, Kuya Roy decided it was time to introduce me to durian, which is the favorite fruit of most Filipinos. 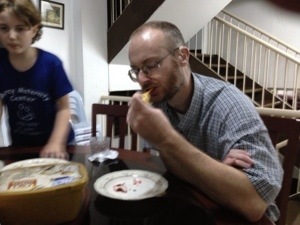 Sora had had her first taste back in 2009, but I was still a durian virgin after almost five months here. Now, durian is the most popular fruit in the Philippines, but it is an “acquired taste” in the same way the Maginot line was a “challenging ostacle”. This is a fruit that is telling everyone, in as many ways as it can muster, that it does not want to be eaten. First, there is no picking it. It grows on very tall trees, 80 to 160 feet high, so that the fruit usually cannot be collected until it falls off of its own accord. If Isaac Newton had sat under a durian tree rather than a harmless apple tree, he would never have lived to formulate his law of gravity, for the fruit is the size of an American football, and it falls at such deadly speed that it is not allowed to be grown within the precincts of Davao City, as being a danger to the lives of passers-by. Next, if your bravery and precaution have put you in possession of the fruit, you are still no closer to eating it. It is covered in a rock-hard shell studded with razor-sharp spikes. To cut it is a job for professionals, and indeed, Kuya Roy brought his durian fruit to our house pre-cut. While washing a couple of dishes, I bumped my hand against the durian as it sat in a plastic bag next to our kitchen sink. It almost drew blood, even through the plastic. But suppose you manage to cut it and prise it open without injuring your hand. Now surely heaven awaits those who have persevered? No. Having thwarted the strategies of self-preservation that durian has borrowed from the gibbon and the pufferfish, you are faced with its last line of defense: that of the skunk. While Wallace cautions that “the smell of the ripe fruit is certainly at first disagreeable”, later descriptions by westerners are more graphic. 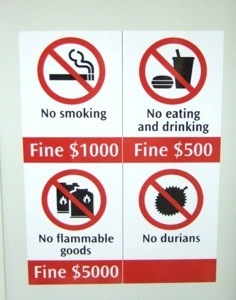 British novelist Anthony Burgess writes that eating durian is “like eating sweet raspberry blancmange in the lavatory”. Chef Andrew Zimmern compares the taste to “completely rotten, mushy onions.” Anthony Bourdain, a lover of durian, relates his encounter with the fruit thus: “Its taste can only be described as…indescribable, something you will either love or despise. …Your breath will smell as if you’d been French-kissing your dead grandmother”. Travel and food writer Richard Sterling says: “… its odor is best described as pig-[excrement], turpentine and onions, garnished with a gym sock. It can be smelled from yards away. Despite its great local popularity, the raw fruit is forbidden from some establishments such as hotels, subways and airports, including public transportation in Southeast Asia. I did at length sample the fruit. 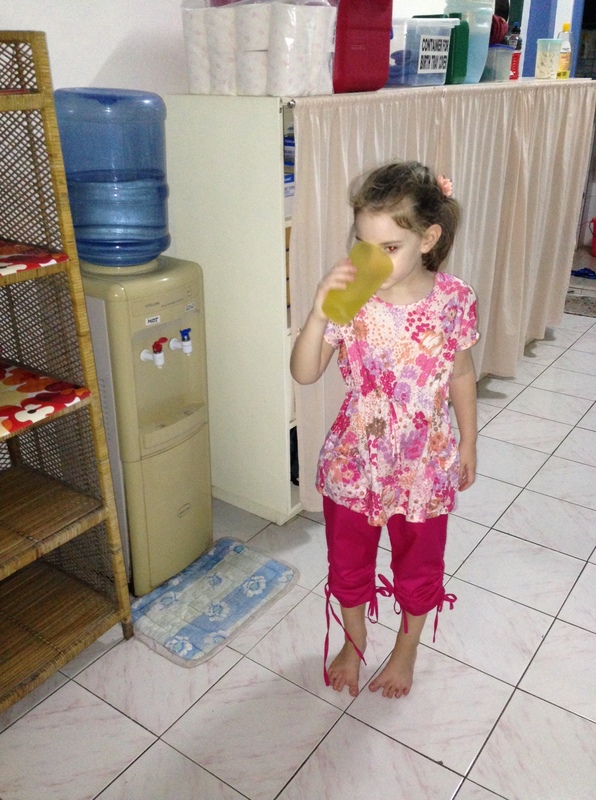 Fortunately, I had near at hand a fresh glass of calamansi juice for a chaser. After that, I helped myself to another serving of Ate Kathie’s leche flan. I will need a little more time to acquire the taste, I think. The durian is now in our refrigerator in a sealed plastic container. And the container is inside a sealed plastic bag. Last night was Hosanna’s first time to come with me on a birth room shift. Her first shift was a busy one! I’ve chosen to take the girls at night for their first shift for two reasons. First, eight hours is a long time for a little person and at night they’ll sleep for part of the time. Second, apart from births there is a lot less going on during night shift — no prenatals, no baby checks, no extra clinic staff. In the morning the birth center can be extremely busy even if there is no one in labor! When we arrived at the birth center at 9:45, we found that swing shift (2:00 pm to 10 pm) had been quite busy: three births — one baby born in a taxi just before pulling up outside the clinic at 9:30 pm — and one patient still in labor. The first thing we saw when we walked in was a newborn wrapped up in a blanket lying by himself on a couch. His mother had been transported to the hospital because of a complication and the midwives on shift were all busy with the taxi birth that had just taken place. 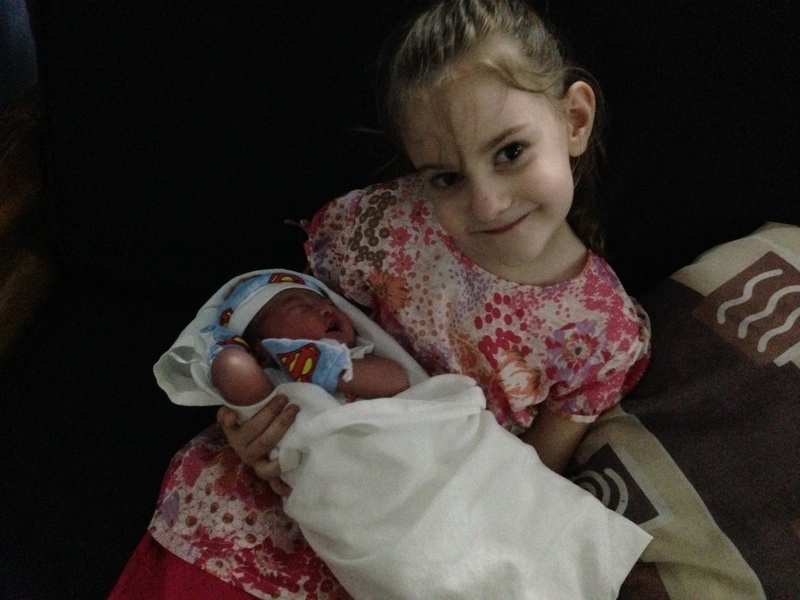 Hosanna made sure little “Superman” didn’t get lonely waiting for his daddy and lola (grandmother) to come and pick him up. It’s a bird… it’s a plane… it’s a baby! Don’t cry, baby. I’ll hold you until your mommy comes back from the CR. During this time Hosanna went back and forth between the birthroom and the “midwives station.” She played Minecraft on my laptop while I did the boring parts — she was happy not to have to compete with her siblings for a turn at the computer. But she was also very willing to help out whenever there was a job she could do. Watching babies be born is thirsty work! 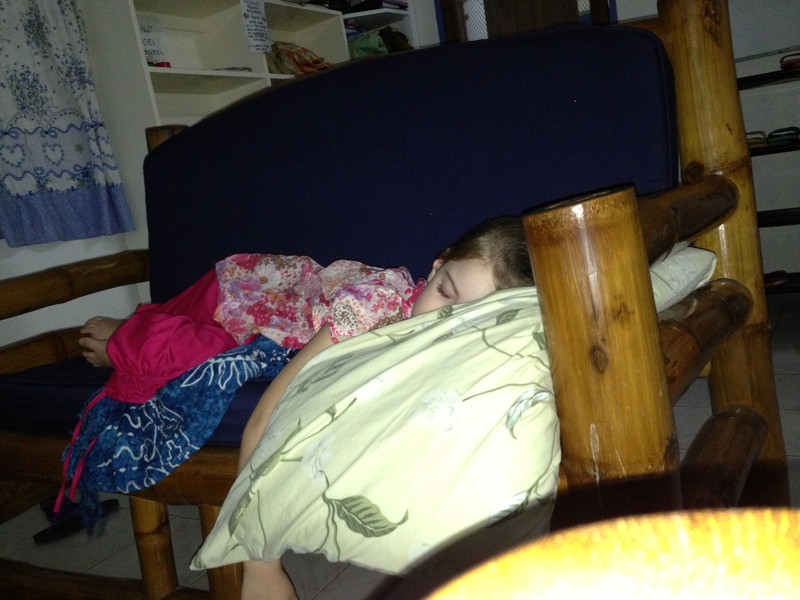 Finally, after 3:00 am, she fell asleep. She had asked me to wake her up when it was time to give the taxi baby his bath but when the time came there was no waking her. Finally asleep a little after 3:00 am. The birth center where I’m volunteering is very family-friendly, and midwives who have daughters are welcomed and encouraged to bring them to work. Hosanna will come on her first birthroom shift later this month, and Naomi has joined me at the clinic several times in the last few weeks.Our shifts are 8 hours: 6 am to 2 pm, 2 pm to 10 pm, or 10 pm to 6 am. Naomi has eagerly come with me three times so far and always has a great time. Much to her disappointment, there have not yet been any babies born while she was there! A typical day sees between two and five babies born, though there have been as many as 14 born in one day before. It’s very rare for 24 hours to go by with no births. But now and then we’ll have a “quiet” shift with no babies born and this has been the case each time Naomi has come with me so far. Back in the states, sterile gauze come prepackaged and pre-sterilized. 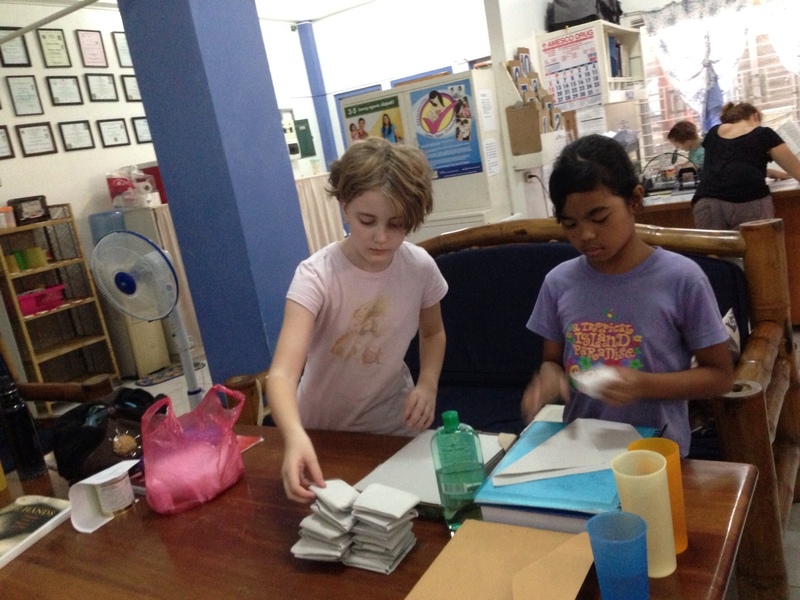 All the gauze used here at the clinic (and we use a lot for 1500 births a year!) is folded, wrapped, and sterilized “in house.” First the long roll of gauze is cut into large pieces which are carefully folded so that all the cut edges are on the inside. Then two squares of folded gauze are wrapped in a paper packet. Naomi and Princess did a great job of wrapping! 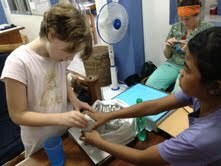 After the gauze is wrapped, it goes into a cloth bag to be autoclaved, along with the cloth packages of instruments. Naomi is hoping to see her first birth soon, but in the meantime, she’s finding ways to keep busy and help out on shift! A recent episode of Anglican Unscripted reported on the New Wineskins conference. (I believe our beloved Canon Bill Jerdan and some folks from SAMS USA were there.) What struck the hosts Kevin and George most strongly at that conference was the way in which Internet technology is changing the way missionaries relate to their senders and churches. There is no more mailing of videotapes; no more wait of weeks to receive letters. Everything is instant. This benefits missionaries as well as churches. We use Skype and Apple’s Facetime to keep in touch with our two oldest kids in Canada. I also have continued to teach the same Bible study that I have have taught for 9 years at our parish in Cincinnati. It is a study that for years has met over breakfast with sausage and bacon, so that I like to joke that it is “full of grease and truth”. I can’t be in the same room anymore, but I eat my liempo or lechon while my beloved friends eat their bacon, and we still have good discussions about the Scriptures. Two weeks ago, I was a virtual “greeter”, waving to our parish’s members from a computer screen set up in the narthex before the service. Another monthly email newsletter is on the way out this week, to find its place on church bulletin boards. But we would love to Skype with any of our senders or churches who are interested. Drop us an email and let us know what time is good for you. Technology is great, but we know how special it is when our friends write to us on paper, so we try to reciprocate. This week, Naomi wrote one letter (with extra artwork by Hosanna) and I wrote another. I sat down at a table with stationery and a fountain pen (of course!) and filled four pages. It was really quite soothing. 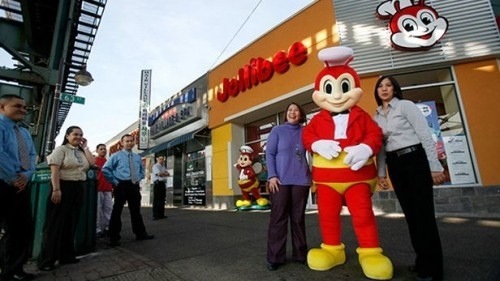 Then I took the two letters in their stripey international envelopes to the post office in Victoria Plaza, located near the comical fast food restaurant, Jollibee. The clerk took them, squeezed the air out of the envelopes, and ran them through a machine that pressed them with red ink (not adhesive stamps). 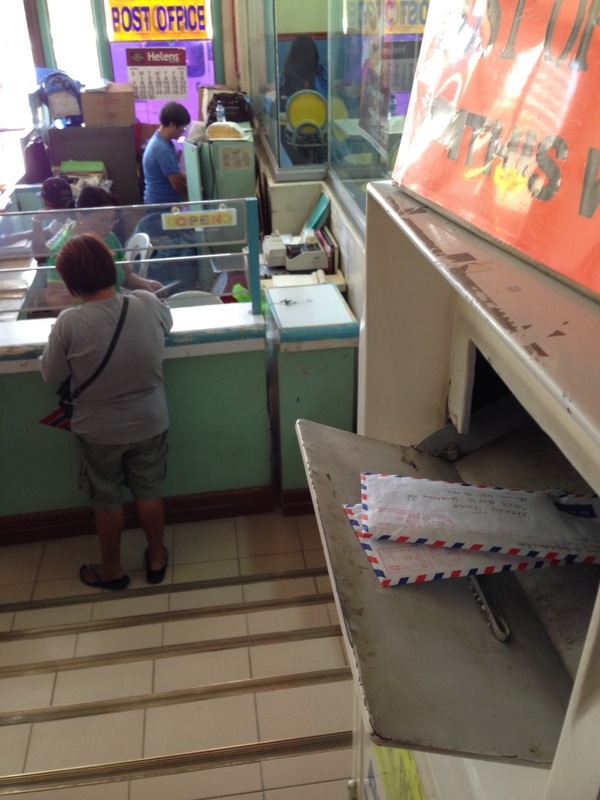 I slid my pesos under the glass, and took the letters to the mailbox up the steps. Wendy and Susan, you may expect them soon!